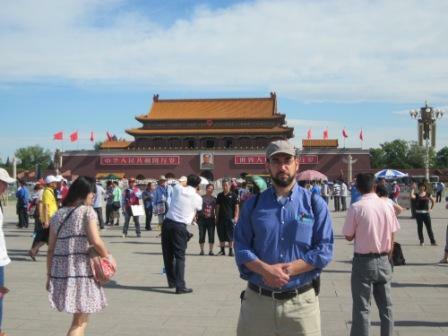 The Forbidden City is truly impressive and was designed with that purpose in mind. One trend I’ve noticed about the Chinese is that when you would reasonably expect something to end, it just goes on and on by them. 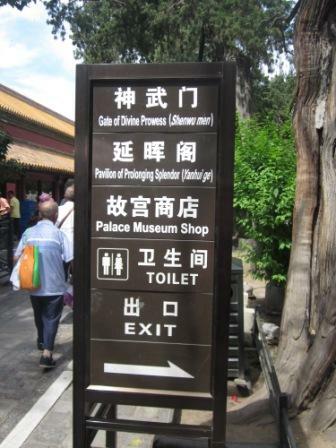 The Forbidden City was a demonstration of barely unbridled excess focused exclusively on the preeminence of one individual (the Emperor) and had the rest of the universe revolve around this one person. After walking through a massive courtyard, climbing steps to a beautifully adorned tower and doing the same thing a few more times, you are shocked to discover you haven’t reached the front door yet. Apparently, over dynasties and generations these emperors become more and more disassociated from the average person and lived in a dream world of greater and greater excesses while the rest of the population starved to death. It is no surprise then that people embraced communism afterwards and that descendants of the imperial family live in obscure anonymity and ignominy. No group tour is complete without a tourist trap and today’s start was unusual in that it was to a drug store. 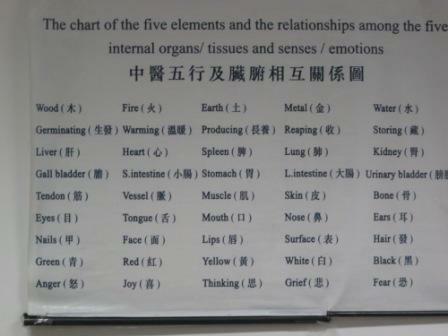 We were taken into a classroom, given a lively lecture on the five elements and Chinese Traditional Medicine. I promptly fell asleep as I have traditionally done whenever anyone ever stood up and lectured me. After the refreshing nap they called in a squad of Chinese doctors (all male, all between 50-60 years old, none of whom spoke English) and an equal number of women in nurses outfits (all female, all between 20-30 years old, all spoke English, all possessed of remarkable sales abilities). The “doctor” took your pulse, looked at your tongue, asked a variety of health questions and then prescribed some Chinese herbal concoction that would cure you and by-the-way was on a special sale in their pharmacy for only $100 for a month’s supply. I had unsurprising ailments that I had readily admitted to. Tamara is thankfully and unsurprisingly in fine health (I trusted their credibility slightly more when they gave her a clean bill of health). We’ve walked over a kilometer already and this is only like the servant’s entrance or something. 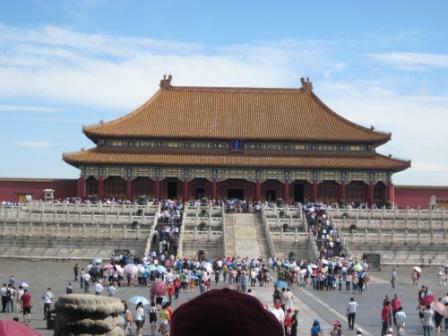 The Temple of Heaven or the Hall of Prayer for Plentiful Harvest was a former place of Avodah Zara and animal sacrifice. 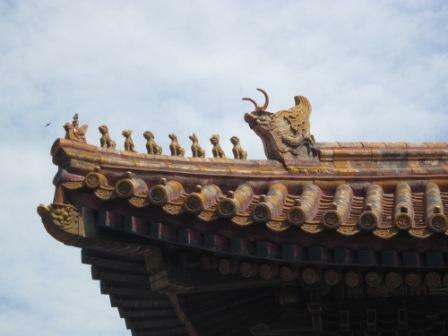 The Chinese seemed to have stopped believing in any gods long ago (who can blame them?). Now it is a popular spot for playing poker. I based myself on the halacha that if a goy is mevatel his avoda zarah then it is no longer avoda zarah and permitted ourselves to view the picturesque tourist attraction. Afterwards, we were taken to a “tour” of a pearl “exhibit”. The sales lady cut the presentation to a few short minutes and spared most of the pretense of it being informative. I was pleased to see an item I bought for 20 Yuan on sale for 500. Anyone remember this shot from Mulan? The Summer Palace though very pretty and impressive represents perhaps the height of imperial absurdity. To call it a Palace is a misnomer. It is more like a state park with a gigantic man-made lake that took 17 years to complete. The extravagant work was initiated by the infamous Dragon Lady, a former empress, mother of a young emperor and power behind the throne for 48 years during the late 1800’s. She is apparently still cursed by the Chinese to this day. She was fond of having 200 dishes served to her every single meal, most of which was thrown out immediately afterwards, which probably could have fed a family for three months, while she is surrounded by a vanquished, starving population, while she is more obsessed with food, pearls and keeping her youthful beauty. All great Kodak moments, however, around the lake and structures. On the ride back, we found ourselves seated next to preachers (husband and wife team) of 7th day Adventists. We had a long theological/religious discussion where I found myself explaining the Jewish view of a lot of psukim from all over Tanach which are apparently the tenets of their faith and variably agree or conflict with our point-of-view. They really knew their Bible, but I think I held my own and perhaps got some new readers for my biblical fiction. We caught the Kung Fu Show. Impressive display of dance and martial arts. It’s basically a ballet/musical for guys who like weapons and fighting. Entertaining. Trying to find a taxi back to the hotel, we were refused by the first cab as it wasn’t the direction he wanted to go. He referred us to his friend who had a motorized bicycle with a small two-seat carriage in the back. We went for it. 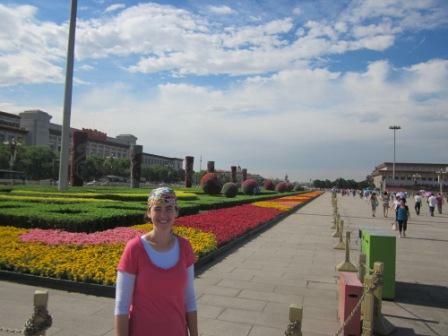 It turned into a wild hour-long ride through both side-streets and major roadways of Beijing. The advantage of this transport is that he can alternate between pretending to be a car or a pedestrian and completely ignoring traffic signals. Red lights were meaningless for him. Oncoming traffic did not perturb him. At one point we had to stop smack in the middle of a major intersection with cars coming from all directions. He kept his cool, stood his ground and moved forward with dogged determination. Fun, even exhilarating at times (close encounters with large vehicles has that effect on the nervous system), but we were relieved when we finally made it to the hotel. It is common knowledge that in 1979, China, in an attempt to calm its fast-growing population, instituted a law known as the One-Child Policy, which as the name implies, limits each family to only one child. Surprised at seeing many obvious two-child families, I inquired further. The law only applies in urban centers and even then, not to families where either parent has no sibling (so the 4-2-1 scenario, i.e. one child having to support two parents and four grandparents seems unlikely). There are a few ironic statistics. The Chinese birth rate was already going down precipitously before 1979, due in part to a voluntary encouragement by the government for families to reduce the number of children. After the law went into effect, the birth rate went UP. As of 2008, when the last census was done, the official birthrate stood at 1.8 (i.e. much closer to 2 than 1, and significantly above most European countries (though still below the natural replacement rate)). 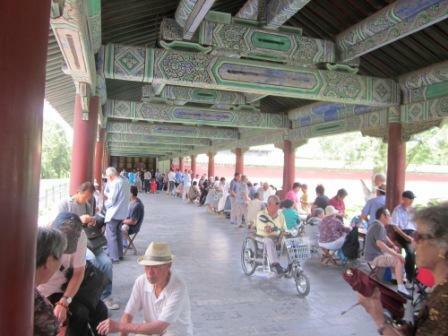 Poker players at the Temple of Heaven. Is this some new type of worship?